The books we read as children are often simple (and let's face it, silly) but that doesn't mean they aren't powerful pieces of literature. 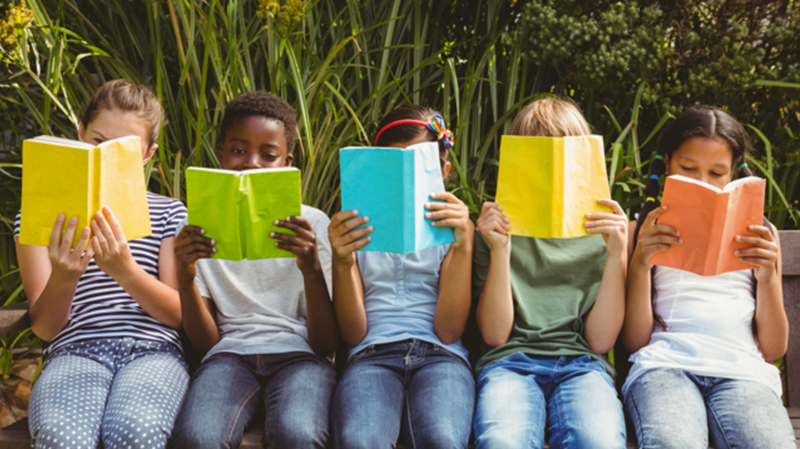 Here are 50 of our favorite books for kids, which are sure to leave you a little bit nostalgic, and—we hope—eager to hit up the children's section at your local library. This peaceful and beautifully illustrated story is about a father and daughter, and a snowy winter walk. Under a bright moon, the pair encounters all kinds of nighttime creatures, but seek one in particular: the great horned owl. Yolen herself described the work perfectly as "... gentle yet adventurous, quiet yet full of sound". "On Thursday, when Imogene woke up, she found she had grown antlers." Thus begins David Small's whimsical tale about a little girl, a seemingly big problem, and the many surprising joys that result. This sing-songy story of a father and his kids going on a "bear hunt" has suspense, mirth, lots of gorgeous watercolor illustrations, and—as you might have guessed—is less about hunting bears and more about the joys of family adventures. The ongoing adventures of Little Critter, first published in 1977, chronicle the many universal experiences (and emotions) of childhood. From When I Grow Up to The New Baby to I Was So Mad, author and illustrator Mercer Mayer turns the complex experience of growing up into simple, enduring, and endlessly enjoyable little stories. Keats' 1962 work won the Caldecott Medal and is regularly regarded as a masterwork in children's literature, but even those accolades don't do justice to the story's poetic beauty. It follows a young boy named Peter as he navigates a winter wonderland, and is as magical as the actual experience of venturing out after a fresh snowfall. Non-city dwellers might not be familiar with the term "tar beach"—which describes the blacktop roofs at the top of many urban buildings. While they might not sound like the ideal setting for a kid's book, just picture a hot summer night, a sky full of stars, and a city full of lights, and you'll start to understand the undeniable charm of this beautiful story. A crocodile named Bill lives on the Nile with his best friend Pete, who is a bird and also his toothbrush. What more could you ask for in a children’s book? The Tomie dePaola series follows the duo as they experience crocodile school together and find themselves in deep water, so to speak, with the aptly named villain from Cairo: “Bad Guy.” Bill and Pete is complete with vibrant illustrations and a hidden world geography lesson. Every grade schooler’s dreams and nightmares coalesce in this classic prank tale of a teacher at wit’s end with her rowdy students. Mrs. Nelson returns to school one day in disguise as the wicked, no-nonsense substitute “Miss Viola Swamp.” The slow, cinematic reveal that follows is glorious. Mischievous students will know better than to launch spitballs at the ceiling after reading this book—a takeaway we’re sure teachers everywhere are grateful for. Arnold Lobel creates a whimsical world in which two best buds, a frog and a toad, navigate life’s changing seasons together (sometimes while atop a tandem bike). The four-part series never shies away from exploring darker areas of life: Topics like loneliness, depression, and self-doubt aren’t exactly ripe for children’s literature, but in Lobel’s hands they become effective teaching moments. He reminds us that our friends will help us to weather these storms. “If you are a dreamer, come in,” begins Shel Silverstein’s 1974 book of highly imaginative children’s poems. Where the Sidewalk Ends introduces early readers to poetry’s infinite possibilities, running the gamut from throwaway gags (“Carrots”) to the deeply profound (“Listen to the Mustn’ts"). Why is a crocodile living in an apartment on East 88th Street in New York City, browsing fancy department stores, and taking overly indulgent baths? These are questions you’ll just have to put aside (he is a very cultured crocodile, okay?) to enjoy this whimsical story about reptilian friendship and second chances. Author and illustrator Robert McCloskey is probably best known for his 1941 book Make Way for Ducklings, but our personal favorite is the charming Blueberries for Sal. McCloskey’s pen and ink drawings help bring Little Sal and her mother’s blueberry picking adventure to life. Curious young readers will be enamored with the escapades of 11-year-old Harriet M. Welsch, budding journalist and full-time spy. They’ll also be able to relate to Harriet’s struggles with growing up, feeling lonely, and learning how to admit you’ve made a mistake. Jan Brett’s intricate, imaginative illustrations transform this Ukrainian folktale into a lively comedy of errors. Keep an eye on the margins as you read for concurrent storylines and hints of what’s to come. The Little Blue Truck series follows a sweet old-fashioned truck as he beeps along the countryside, but in Little Blue Truck Leads the Way, he finds himself stuck in traffic in a big city. While admiring the super-tall buildings and the confident buses and taxis, he soon volunteers to transport the mayor across town when his limo breaks down, and Little Blue shows his new city-vehicle friends how much faster they can all go when everyone lines up single-file. For the kid who loves spooky mysteries, The Dollhouse Murders is a classic ‘80s throwback. When Amy and her sister find a beautiful dollhouse in their aunt’s attic that is an exact replica of their longtime family home, the girls come to notice that the dolls move on their own and seem to be recreating their great-grandparents’ real-life murders. As Amy begins to do more research into the family history, she realizes the dolls are trying to show her who was really complicit in their deaths. This Caldecott honoree (for illustrator Betsy Lewin's work) shows youngsters just how powerful a well-orchestrated strike can be. When Farmer Brown’s cows protest the cold conditions of their barn by typing him letters demanding heated blankets, the chickens also eventually join the cause. A farm with no milk or eggs, bemoans the farmer! This board book proves that a little determination (and some first-rate negotiation skills) can go a long way. This 1961 novel about a young boy who is determined to own a pair of coonhounds is both a tribute to hard work and companionship, and a primer on how to handle some of the tougher aspects of life. Billy and his beloved dogs Old Dan and Little Ann make quite the team, and though they earn the reputation of being the best trappers in the Ozarks, tragedy eventually befalls the crew and Billy learns a big life lesson about love and sacrifice. Where the Wild Things Are is Maurice Sendak’s best-known work (even we couldn't hesitate putting it on this very list), but Higglety Pigglety Pop! is a cult classic. The book follows Jennie the Sealyham terrier as she leaves her life of comfort in search of fulfillment. It’s dedicated to Sendak’s dog of the same name. For his horror series, author R.L. Stine veered outside typical kid-lit territory. Instead of friendly animals and happy children, Goosebumps acquainted readers with malicious land gnomes, living dummies, and cuckoo clocks of doom. What’s fun for 4-year-old Ramona Quimby leads to frustration for her 9-year-old sister Beatrice (or “Beezus” as Ramona likes to say). Whether or not you relate to the struggles of having a younger sibling, Beverly Cleary’s classic novel is essential reading. When the Monroe family discovers a rabbit in their car after a viewing of Dracula, it's only natural that they keep the creature—and call it Bunnicula. But Harold, the family dog, and Chester, the family cat, have their suspicions about the new pet, who seems to have fangs and sleeps all day long, only to wake up at night. Then, vegetables start showing up in the kitchen, drained of all their juices and stark white—with two fang marks in them. Could it be that Bunnicula is more than just a bunny? Is the Monroes' new pet … a vampire?! When an ogre with an appetite for the flesh of children stalks a town, its residents take drastic measures, hiding their kids underground. Starving, the ogre lies in wait for a child to pass by. Meanwhile, in a valley far away, a sick father sends his young daughter, Zeralda—a talented cook—to the town's market in his place. When the ogre and Zeralda meet, she's able to tame his ferocious appetite with her culinary prowess. This book, written and illustrated by Tomi Ungerer, is undeniably weird (especially the unforgettable last page), and also wonderful. Gregory the goat only wants to eat fresh fruits and vegetables—he's not at all interested in the boxes, old shoes, and other junk food that his family eats. Try as they might, Gregory's parents cannot get him interested in the food they think he should be eating, and take him to a doctor to figure out how to get their son to adopt a balanced diet. We won't spoil the ending, but suffice to say, human parents might want to keep Gregory, the Terrible Eater around for when kids argue that they should be allowed to eat as much ice cream as they want. Jack of "Jack and the Beanstalk" fame guides readers through these silly parodies of classic fairy tales like "Little Red Riding Hood" ("Little Red Riding Shorts") and "The Princess and the Pea" ("The Princess and the Bowling Ball"). Written by Jon Scieszka and illustrated by Lane Smith, the tales are fun for kids and adults alike. Hungry for more? Pick up Scieszka and Smith's The True Story of the Three Little Pigs. On Horace the Elephant's 11th birthday, he invites all of his friends over for a costume party and a fantastic feast—but when it's time to eat, the feast has disappeared. Can readers follow the clues and help Horace solve the mystery? Graeme Base's intricate illustrations are packed with hints at who's behind the theft, and a sealed packet at the end of the book provides answers. The Cat Who Went to Heaven (1930) tells the story of a poor artist in Japan, whose love for his tiny pet calico kitty leads to a miracle. According to Buddhist lore, the cat was the only creature in the animal kingdom that didn’t honor the Enlightened One on his deathbed. Due to its arrogance, it’s forever banned from heaven. But when a local temple hires the artist to create a mural of the Enlightened One on his deathbed, surrounded by animals, he’s faced with a tough choice: Should the artist include his beloved pet, or adhere to tradition by leaving her out? Ultimately, it’s not the artist, nor the monks, but the Buddha who makes the final decision. Hitty, Her First Hundred Years (1929) tells the story of a wooden doll, Hitty, and several generations of girls who love her. Carved in the 19th century, Hitty’s first 100 years are filled with adventures, tragedy, travel, and intrigue: She sails the world on a New England whaling ship, comforts a young Quaker girl during the Civil War, meets Charles Dickens, and ultimately ends up in the window of a New York City antique shop, where she sits full of secrets. There are more than 300 books in the Berenstain (not Berenstein) Bears series, imparting important lessons on subjects like staying healthy, avoiding strangers, telling the truth, going to the doctor, and welcoming a new sibling. The Berenstain Bears and the Messy Room focuses on the importance of keeping your spaces tidy, taking care of your belongings, and working together—a great book to have on hand for when your kids just don't want to put away their crayons. For kids, The Little Prince is a sweet tale of a little boy who traveled from an asteroid to get to Earth, encountering all manner of disappointing adults along the way. But the classic book—which was written in New York shortly before Saint-Exupery left for WWII, where he died while flying a mission over occupied France—gets better, and more layered, as you get older. Saint-Exupery went through a number of drafts of the most famous line from The Little Prince, "What is essential is invisible to the eye," and it's a lesson that resonates, no matter how old you are when you read it. Before there was Judy Hopps in Zootopia (2016), there was the brave Doctor De Soto the dentist. Being a mouse, the dentist tried not to work on predators, but when a fox comes in with a toothache, what's a kind rodent to do? De Soto and the ailing fox have to find clever solutions to fix the tooth without any unexpected meals. Kids can be mean when you're different. Oscar the dachshund has short legs, and his classmates make fun of him, especially when he debuts his hot dog costume on Halloween. But that all changes after one heroic act that brings the acceptance of his canine peers. Mr. Lunch, the professional canine bird chaser, gets into a lot more exciting adventures than your average pooch. Throughout the series, the bold dog borrows a canoe, mails letters, makes an appearance on television, and takes apart people's suitcases in the bottom of a plane. Thanks to their black and white coloring, penguins look just like they're wearing tuxedos. Helen Lester imagines these well-dressed penguins to all be fancy, well-mannered birds. All except Tacky, the outrageous penguin who starts as an outsider, but eventually shows his fellow penguins that staying true to yourself is what's most important. It doesn't matter if you're seven or 77: Everyone has a bad day every now and then. Poor Alexander wakes up with gum stuck in his hair, gets in trouble at school and at home, and has to eat lima beans for dinner (gross!). He swears he's going to run away to Australia—until his mom tells him that they have bad days Down Under sometimes too. Viorst's book, first published in 1972, reminds kids and grownups alike that if today doesn't go your way, tomorrow is another day. Wayside School was supposed to be one story tall, with 30 classrooms all in a row. Instead, it's 30 stories tall, with one classroom on each story. But that's not even the weirdest thing about it: There's an evil teacher who turns children into apples, a dead rat who masquerades as a new student, talking pigtails, and a toe sale. And then there's Miss Zarves, who teaches on the 19th story. Except there is no 19th story, and there is no Miss Zarves. Confused? That's kind of the point of this weird-and-wacky collection of interconnected stories. A fictionalized account of Ingalls Wilder's life on the prairie frontier in the late 19th century, this series (eight books published during her lifetime, often sold as a set with a ninth that was published posthumously) remains an abiding classic of American children's literature, even if some of the depictions, especially of Native Americans, haven't aged particularly well. Wanda Petronski wears the same old dress to school every day but says she owns a hundred of them—a claim that elicits such merciless daily mockery from her classmates (as does her "funny" name) that her family moves to a city so they'll be among other immigrants. After Wanda leaves, her classmates learn that she did have a hundred dresses, in a sense—and they regret their cruelty. A story about immigration, bullying, poverty, creativity, and the need to stand up for what's right, the book won a Newbery Honor in 1945 and has never been out of print. Mo Willems' signature humor shines in this tale of best friends Piggie and Gerald, who respond to a family of birds making their home on Gerald's head with hilarious chagrin (Gerald) and delighted pragmatism (Piggie). While laughing at the absurdity of it all, kids also get lessons about emotional response, thinking through a problem, and the support of friendship. In this mid-century fantasy tale from the UK, a weird creature appears on the village green after a wild summer storm. It's a round, soft, fuzzy ball without eyes, nose, mouth, or feet—but it moves on its own, and the children who find it know it's alive. They work together to protect and care for the strangely charming, grapefruit-sized "moonball." Before there was Babe, the pig who wanted to be a sheepdog, there was Wilbur—a sweet little pig who avoids slaughter with the help of a colorful group of barnyard buddies, including a clever spider named Charlotte who spins webs that praise the oinker as “terrific” and “some pig.” This nifty little trick turns Wilbur into a bit of a celebrity, which saves his bacon—literally. But not all of Wilbur’s friends are so lucky. E. B. White’s beloved children’s novel remains a classic, and with its themes of love, friendship, and loyalty, is as relevant to kids today as it was in 1952, when it was originally published. Charlie Bucket doesn’t have what you’d call an enviable life: The sweet-natured tween lives in a tiny house with his parents and both sets of grandparents, the latter of whom share the home’s only bed. But Charlie’s luck begins to change when he becomes one of five kids to find a golden ticket, which wins him a personal tour of elusive candy-maker Willy Wonka’s factory, plus a lifetime supply of chocolate. But Wonka's got bigger plans for Charlie. Lots of silliness, made-up words, and Oompa-Loompas ensue. If you’ve only ever seen the big-screen version of Roald Dahl’s inimitable novel, you’re missing a big chunk of the story, as there are major differences between the book and both Mel Stuart’s 1971 cult classic and Tim Burton’s 2005 reimagining. Author Katherine Paterson won the Newbery Medal for this 1977 novel, in which two misunderstood kids—Jess Aarons, the only boy in a five-kid family, and Leslie Burke, a brilliant tomboy who is a newcomer to Jess’s hometown—form an unlikely friendship and turn the woods near their house into their own personal paradise. Dubbing the place “Terabithia,” Jess and Leslie spend their time there escaping the harsh realities of their tumultuous family lives. But when tragedy strikes, Jess discovers that the magic of Terabithia wasn’t just in their imaginations. Sendak's love letter to independence was based on his own childhood experiences. (Minus the monsters.) As entry #20 can attest, we think Sendak is an author worth revisiting again and again. Licensed picture books are not normally confused for literature, but this simple story of Sesame Street's Grover growing increasingly frightened over the suspected monster lurking in the book is a fun (and harmless) introduction to the feeling of apprehension. Blume's "Fudge" series kicks off with this insightful entry about 9-year-old Peter and his insufferable brother. It's a good introduction to sibling rivalry—which frankly, some of us never outgrow. Sherlock Holmes with training wheels: Kid detective Encyclopedia solves neighborhood mysteries with the help of pugilistic female accomplice Sally Kimball, who handles the town bully while Brown pieces clues together. Kit Williams is best known for his 1982 book Masquerade, which set half of England on a real-life treasure hunt. The Bee on the Comb (also known as Book Without a Name) followed in the puzzle book tradition—published without a visible title, it challenges readers to pick up literary and visual cues to find the name of the work. Each page is a literal work of mixed-media art, resplendent with images of the English countryside. A coming-of-age fable loosely based on Medieval unicorn tapestries, the real joy here is the early-'80s illustrations, which are sure to foster a love of animals (well, unicorns) as well as a Stevie Nicks-esque fashion sense.